exclusively to helping companies raise capital. Our team takes a very hands-on approach to help companies understand the fundraising process and launch their funding campaigns. From profile creation to marketing, we’re there at each step. 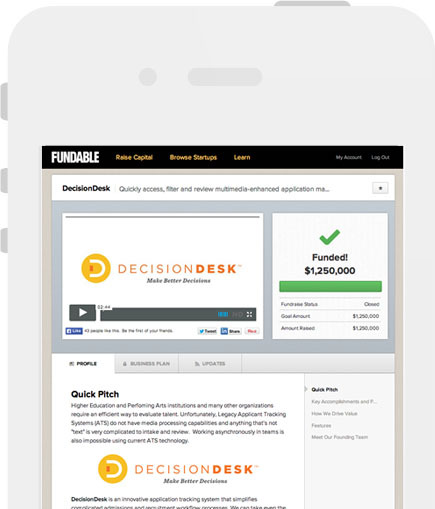 Fundable was created by the founders of startups who have collectively raised from dozens of angel investors and venture capitalists. We understand the challenges you face as you create a business, and we’re happy to offer our personal expertise to all clients looking to crowdfund. In our first year Fundable generated over $80 million in funding commitments from investors, customers, and friends. Those numbers are growing exponentially and we couldn’t be happier. Visionary who builds bold startups, happy families, and unbeaten NBA Jam legacies. Quarterback who leads the offense, loves his family, and appreciates the sanctity of a no-hitter. People Manager who loves time with her family, devouring books, and performing in professional theater. Innovator and global citizen who loves startups, family, and gut busting laughter. Creative Director who loves horror movies, produces music and wears a mean cardigan. Autodidact and programmer who loves exploring and making music. Aspires to help make learning as easy as possible, travel into space, and work with Kanye West. Technologist , designer, performer, installation artist, amateur blacksmith, Oxford comma enthusiast, armchair revolutionary. Data Wizard who loves analyzing data, simplifying processes, adventures with her husband and kids and all things Clemson. Digital marketer & SEO, proud husband and dad, mafia movie lover, Cleveland sports fan, part-time crooner, blogger, and Wordpress aficionado. Relationship + Data Nerd who loves rainy days, hiking, crossword puzzles and charcuterie. Startups Lover, adrenaline junkie, and undisputed national champion of eating ice cream. Avid Outdoorsman who loves mountaineering. Also fails miserably at being a chef and wants to grow up to be Iron Man. Startup Fanatic that cherishes the open road and outdoor adventures. Critics say he's too handsome, too clever, and doesn't take company bios seriously. Senior Analyst who likes beaches & flip-flops, fro-yo with sprinkles, and painting. Senior Analyst who enjoys golf, hockey, and traveling. Wine Connoisseur who loves puppies, CrossFit and scouring Pinterest for new recipes. Idea Aficionado who enjoys hedging the stock market, helping startups, and a good iced cookie. Undercover Tyrannosaurus Rex who lives for design, horsepower, and aggressive style. Literary Genius who spends most of her time writing and reading and wishing she could eat Vietnamese food for every meal. Avid Couch Potato who enjoys a good joke, impromptu TV binges, and isn't superstitious—just a little stitious. Habitual Word Manufacturer and staunch absurdity advocate. Subsists on a strict diet of red wine and bad puns. Growth Hacker, VFA fellow, and unusually tall asian. Organizer of GiveBackHack and lover of dogs, design, and naps. Diet Coke Enthusiast who loves working with people, exploring the world, and running marathons (hopefully one in every state). Proud winner of the Buffalo Wild Wings Blazin' Wing Challenge. Fashionista who never stops planning, is a social media guru, and is obsessed with her french bulldog puppy. Creative Thinker, accidental tennis enthusiast, wife, and mother that enjoys photography and a good glass of wine. Bibliophile, foodie, travel lover, OrangeTheory Fitness enthusiast, Buckeye football fan, and dog mom to her pit mix, Ellie. Brought to you by coffee. Merry Multilingual Musician who is always up for adventure. One of my life goals is to visit a new country every year and to stay fit. At home I play with my one-eyed kitty, Captain Jack. Food Blogger, cat lover, master of board games, and party planner extraordinaire. Mildly Obsessive Sports Fan, especially when it comes to the Buckeyes. Loves planning and enjoys spending time with friends, family, and her yellow lab Archie. Writer, runner, and coffee addict obsessed with tacos and babies. Loves spending time with friends and family and adventuring with her husband.